Sometimes the most powerful meditation practices are also the most simple. This meditation practice is one of my favorites, and it works especially well for individuals whose most dominant sense is sight. The changing nature of a candle flame makes it alive—almost vibrant—so it’s an interesting point of focus. 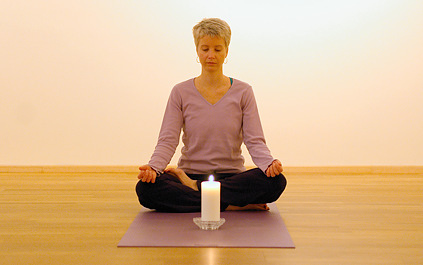 Its only downsides are that you have to do this meditation seated, and since candles involve fire risk, it’s not appropriate in all situations. One of my students, however, found an iphone candle flame app, so with advances in technology, perhaps even that isn’t an issue! Choose a candle you feel drawn to. Preferably choose one with a calming color (blue, purple, green, beige, white). Place it on a low table or on the ground about 3-6 feet in front of you. Light the flame and relax your body. Keep your eyes open, gazing quietly at the candle in front of you. Notice your breath—without intentionally trying to change it. First notice the warmth and coolness of the breath at the tip of your nostrils. Notice the movement of your rib cage and belly. How does your spine move with each breath? What other sensations can you feel? When you feel ready, focus your mind by gazing steadily at the candle flame as it burns. Your eyes can be partially closed (at “half mast”) and it is fine to blink. Notice the colors, the changing patterns and shapes of the flame. Become aware of the scent of the burning wax, the warmth of the flame. The flame continually changes with every passing moment. If your attention wanders (and it will!) just notice it, and invite your attention back to the sensation of the breath at the tip of your nose. Then begin to focus on the changing nature of the candle flame again. Come visit Whole Life Yoga in Seattle, and join my Tracy Weber author mailing list for updates on my hopefully soon-to-be-published yoga mystery! This entry was posted in Meditation on March 25, 2013 by Tracy Weber. One of the key hallmarks of Viniyoga is its unique combination of movement, flow and stay. Some yoga lineages, such as Iyengar and Yin, focus primarily on staying in poses. Others, such as Ashtanga and Vinyasa, primarily flow from pose to pose. Viniyoga, on the other hand, uses stays in poses and flows between them. And we do something even more powerful: we move in and out of most poses before staying in them. What does all of this mean for your teaching and your practice? Understand the tool you’re using and why you’re using it. If your goal is to prepare your mind for meditation, a strong flow class won’t work as well as a class that includes the interior focusing of stays. If you’re a beginner, start by learning appropriate form in individual postures before trying to link multiple postures together in flows. If you’re working to re-pattern negative movement patterns, use repetition in and out of a pose more than stay. And remember: Each tool has its unique purpose and gifts. Over time try to explore all of them. One of the many beauties of the Viniyoga approach is that it skillfully combines all three. This entry was posted in Asana, Teaching Yoga, Viniyoga on March 18, 2013 by Tracy Weber. This week’s blog entry was written by guest author Marcie Leek. Marcie is a graduate of Whole Life Yoga’s teacher training program. She can be contacted at marcieleek@comcast.net. Ten years ago, I taught my first English class. I had returned to college after a many-year gap and was pursuing my master’s degree in English as a Second Language. I had never taught before. It was terrifying and thrilling. As I made my way through school and into my career, I became more comfortable with teaching by creating a lot of external support. I pored over the essays I would teach, I wrote detailed lesson plans and assignment sheets, and I commented heavily on my students’ essays, believing that this kind of attention would both foster a relationship between us and help them learn how to correct their mistakes. In prioritizing my teaching, I unconsciously de-prioritized the rest of my life. There just wasn’t enough time for everything. Time spent with friends lessened. My house was often chaotic because I had neither the time nor energy to clean it. I even ignored my body: if, while grading, I realized I needed to use the bathroom, I would wait until I had graded “just one more.” And then another. I believed that this commitment to my profession and my students made me a good teacher. I thought this was what my bosses and mentors appreciated when they gave me glowing recommendations. I couldn’t see how to teach otherwise. Eventually, of course, I burned out. I got to the point where I couldn’t imagine teaching again. I was exhausted, mentally, physically and emotionally. I took time off with the intention of moving out of my head and into my body. I knew I could do this through yoga. I started attending classes regularly at Whole Life and was reminded of how comforting I found it to be led through a class and then to be given permission to simply rest. There were times I felt such relief to be there – knowing that I had prioritized this quiet and nourishing time above all else – that when I sat down on my mat I teared up. Going to yoga classes consistently, and then going through teacher training, helped me build a bridge between my body, my heart, and my mind. Rather than letting my mind, with its fears and dependence on the external, run my life, I am learning to pause. I have learned that this pause will allow me to find my intuition, what yogic tradition calls my Self, and that this inner voice will never steer me wrong. It tells me when it’s time to take a break from work – or when it’s time to see a friend or play with the dog rather than working. It tells me when I need to settle down – that I’m caught up and will start to make potentially harmful decisions about my work life (too much) or my personal life (too little). I’m learning to listen to my Self. I still have thoughts of “just one more,” and I suppose I always will. The difference now is that I prioritize the voice that quietly says, “You need to pause now” and, more often than not, I actually listen. Check out Marcie’s Yoga for Teachers class at Whole Life Yoga! This entry was posted in Guest Writers, Teacher Training Graduate Stories on March 11, 2013 by Tracy Weber. I’ve been getting a lot of crap—er, feedback—from my students about the cartoon banner on my author website. I’m actually quite fond of it, but my students are right: my cartoon self’s Downward Dog is, in yoga teacher-speak, “worthy of correction.” But at least the German shepherd looks good! Downward Dog (Adho Mukha Svanasana) is perhaps the most familiar of all yoga poses—and one of the most commonly misunderstood. Downward Dog strengthens your shoulders while stretching the backs of your legs, but those are only its secondary effects. In Viniyoga, Downward Dog is categorized as an extension pose, meaning that its primary intention is lengthening the spine. That amazing stretch you feel in your calves and hamstrings is just a side benefit. Come to your hands and knees, with your knees about four inches apart. Your hips should be directly above your knees, and your hands should be slightly in front of and wider than your shoulders. On inhale, lengthen your spine and tuck your toes. On exhale, press down through your hands and feet, lifting your hips to the sky. Keep your knees bent and your chin slightly tucked. Focus on feeling length between the crown of your head and your tailbone. On the following inhale, lower your knees to the mat again, bringing your hips directly above your knees and extending your spine. Move in and out of this position eight times, wrapping each movement in each breath. After the eighth repetition, remain in Downward Dog for several breaths. With each successive inhale, press down through your heels while simultaneously extending your tailbone to the sky. On each successive exhale, contract your abdominal muscles, feeling the strength of your core. Consider cartoon-Tracy a drawing of what not to do. In particular, do not lift your chin or round your lower back. Your chin should be slightly tucked and your low back extended. Your heels do not have to touch the floor, and your legs do not have to completely straighten. Focus instead on feeling the length of your body from head to tailbone and from tailbone to heels. To minimize wrist strain, spread your fingers and press your weight equally out through your fingertips. Avoid pressing your chest too close to your thighs. This can hyper-extend your shoulders, which adds significant strain to your shoulder joints. Instead focus on feeling strength in your shoulders. Come visit Whole Life Yoga in Seattle, and join my author mailing list for updates on my hopefully soon-to-be-published yoga mystery! This entry was posted in Asana, Viniyoga, writing on March 4, 2013 by Tracy Weber.